Netflix yet again slashed its roster of Marvel television series on Thursday, when the streaming site canceled the superhero show Daredevil after three seasons. "Marvel's Daredevil will not return for a fourth season on Netflix," confirmed in a statement released to Deadline on Thursday evening. "We are tremendously proud of the show's last and final season and although it's painful for the fans, we feel it best to close this chapter on a high note. We're thankful to our partners at Marvel, showrunner Erik Oleson, the show's writers, stellar crew, and incredible cast including Charlie Cox as Daredevil himself, and we're grateful to the fans who have supported the show over the years." 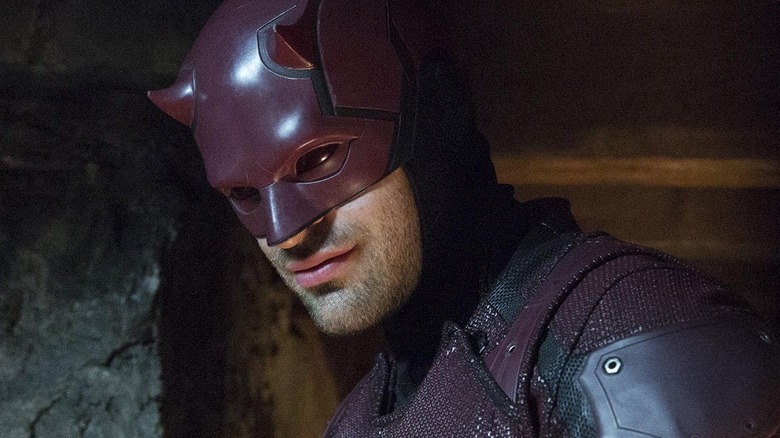 Neither Netflix nor Marvel Television offered an explanation as to why Daredevil was canceled, but Deadline reports that the two companies had been "arguing over the season orders" since Netflix chose to shorten all seasons of Marvel series from 13 episodes to 10, and that tension "may have played a role in Daredevil's demise." Additionally, trouble had apparently been brewing behind closed doors: "creative issues" sparked a changing of showrunner for each new season of Daredevil, and that might have affected the series' production in a detrimental way. The move to pull the plug on Daredevil, which centers on the titular blind vigilante as he tries his damndest to protect the people of Hell's Kitchen in New York and evade his powerful enemy Wilson Fisk (Vincent D'Onofrio), followed just six weeks after the series debuted its well-received third season — one that critics called "a nail-biting exercise in perfectly-executed tension" and "a dark and powerful rollercoaster of redemption that makes every scene count" that kicked "Marvel's Netflix slump to the side." Daredevil's cancellation also comes after Netflix axed two other Marvel series: the Finn Jones-led Iron Fist (after two seasons) and the Mike Colter-starring, Harlem-set show Luke Cage (also after two seasons). Now that Daredevil has joined the two fallen Marvel-Netflix projects, the only series in that realm that remain are Jessica Jones, top-lined by Krysten Ritter, and The Punisher, in which Jon Bernthal reprises his Daredevil character Frank Castle. Like they were when Netflix announced Iron Fist and Luke Cage had bit the bullet, fans were blind-sided by the streamer's decision to end Daredevil, particularly because the series has been strong from the start. Sure, as with all television shows, Daredevil stumbled in certain episodes and dealt with some pacing issues — but it still stands as the best-rated Marvel-Netflix show and the second-best rated series in the overarching Marvel Cinematic Universe on Rotten Tomatoes, coming in at a collective 90 percent fresh for its three seasons. The only Marvel show better reviewed on the aggregator is Agents of S.H.I.E.L.D., which stands at 94 percent and has the benefit of an additional two seasons for which reviews have been fully accounted. "Just heard that @netflix cancelled Daredevil after the most breathtaking, exhilarating and intense season. I am so confused… can someone explain?!" one fan wrote on Twitter after learning that Daredevil was no longer. Another quipped, "The cancellation of Daredevil is my villain origin story." Many were also quick to point out what they felt was hypocrisy on Netflix's part, as the streaming site chose to cancel Daredevil but renew 13 Reasons Why, the drama that has found itself in even deeper, hotter water after a recent study concluded that the series is correlated with increased suicide rates. As confounding as it is to Daredevil fans out there, the cancellation isn't without a silver lining. Netflix affirmed that "the three existing seasons will remain on the service for years to come" — so binge-watching Daredevil over and over again is still totally a Thing You Can Do — and that "the Daredevil character will live on in future projects for Marvel." To us, that sounds like Mr. Matt Murdock might make his way to Disney's upcoming Disney+ streaming service, scheduled to launch in 2019. The Walt Disney Company subsidiary Marvel Studios already has spin-off series lined up for Marvel characters Loki, Scarlet Witch, and Falcon and Winter Soldier, all of which are set to star the MCU actors who brought them to life on the big screen — Tom Hiddleston, Elizabeth Olson, and Anthony Mackie and Sebastian Stan. Deadline further claims that "a Daredevil series on the planned Disney streaming platform" could genuinely be an option — and the same goes for another Daredevil movie, which could make recompense for the terrible Ben Affleck-topped one from the early 2000s. However, a film "seems unlikely," according to the outlet. Sources close to Deadline that have inside knowledge on the situation also stated that Jessica Jones season 3 and The Punisher season 2 "are still currently scheduled to run on Netflix as planned." It's worth noting that the streamer hasn't announced when the upcoming episodes will premiere — and given this shocking turn of events that played out with Daredevil, the bigwigs at Netflix could very well never confirm when Jessica Jones and The Punisher will return, and instead cancel them altogether. For our part, we have our fingers crossed that Jessica Jones and The Punisher can survive the Marvel series reaping at Netflix. We'll update you the moment anything — good or bad — happens to the remaining series.